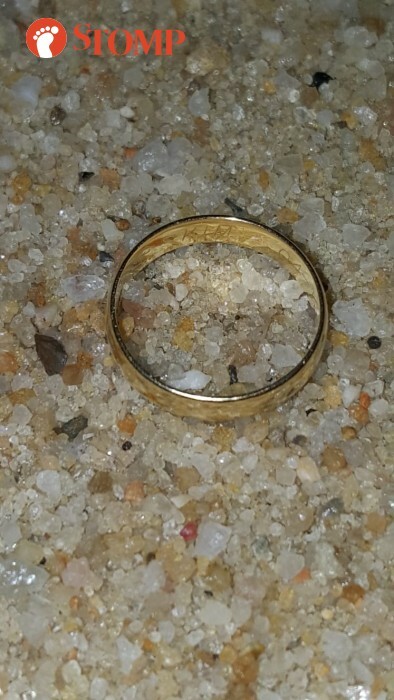 A rose gold ring was found at a beach in Sentosa yesterday (Dec 9) at about 10pm. A Stomper was at the beach and found the ring in the sand. The year of the date inscribed on the ring is 2011. The ring also had the name 'Kim' engraved on it. He said: "The ring has a date inscribed on it, but I don't want to reveal the full date. "If a person claims the ring as theirs, I can check with them the date to confirm that they really own the ring." If you are the owner of the ring, kindly contact Stomp at stomp@stomp.com.sg or WhatsApp 9384 3761 with details of the ring and the location where it was lost.